Stephen Whyte honors his mom's memory with a lasting gift. Gwen Jones Whyte sang in her church choir for years, and the annual performance of Handel's Messiah was always very special to her. Gwen shared her love of music with her family and encouraged her children to play an instrument of their choosing. Her son, Stephen Whyte, chose to play the horn at an early age, and continues to play to this day in a chamber orchestra. Today Stephen is also an actively contributing member of the Seattle Symphony Board of Directors. After a brief illness, sadly Gwen passed away earlier this year. In honor of Gwen, and the music she cherished, Stephen graciously made a special gift in his mother's memory. The Symphony's performances of Handel's Messiah are presented in loving memory of Gwen Jones Whyte. We sat down with Stephen to hear more about his tribute. Can you share the story behind your gift and why you selected Messiah as your way of remembering your mom? It goes back to Longview, Washington, where I grew up. We belonged to the Longview Community Church, which had a very active music program with special concerts throughout the year. The big one for the church, and the entire community, was always a performance at Christmastime of the Messiah. It was a grand production. The choir was made up of 50 to 60 singers, including my mom. She sang in Messiah for years and years; she knew the music and understood the story. We grew up with Messiah. When did you decide to make your gift? My mom and I attended Messiah at the Seattle Symphony a few years ago. She was frail, but in good health otherwise, and it visibly moved her when she heard the music of Messiah. I could tell that she was reliving the memories of a time since passed, when she was younger and raising a family with that strong and close network of friends in Longview centered around this very special music. When my mom passed away earlier this year, I was thinking deeply about what was important to her in her life. I thought that one way for me to share with others something my mom valued and shared with us, would be to invest in a series of performances like Messiah. I wanted my gift to support something that reaches a broad audience and has the potential to be very meaningful for them, as it was for my mom, myself, our family, and the community of Longview. I appreciate the seasonality, and the rhythm, that something like Messiah represents in one's life; how one anticipates its consistent arrival once a year. It brings back very special, heartfelt memories, that are at once deep and uplifting. Why do you believe it's important to support the Seattle Symphony? I believe it is important to communicate the Symphony's musical message broadly within the community, as this will keep the Symphony vital and sustainable. It is also important, for those who are able, to contribute financially to help keep the price of tickets affordable so the Symphony may have the broadest reach within the community. 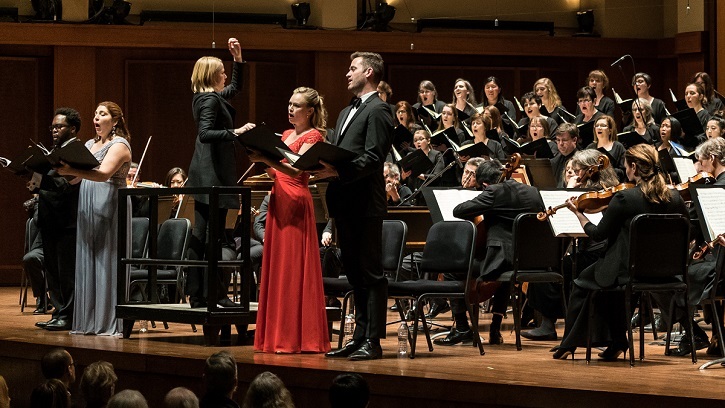 In addition, the Seattle Symphony has been doing some great things on the national stage, and it is important to have a strong donor base for the organization to continue to perform on such a high level. I also believe that it is important for a world-class city like Seattle to have signature arts organizations that allow people to come together and share a common experience. That's the role that the Symphony has proudly established in this region. The Symphony has become a source of pride for the entire community, and I enjoy being part of it. Stephen Whyte's generous support of the Seattle Symphony's Messiah will celebrate the life of his mom over the next 20 years. If you are interested in discussing an investment in your Symphony, please contact Vice President of Development Jane Hargraft at 206.215.4826.